Previous Post: « How Do You Know If Your Blog Post is “Inspired” or “Copying”? Also such endless love for Ty. YEAH GIVE HIM A CREEPY TEDDY BEAR BECAUSE HIS EXISTENCE IS SO ENCOURAGING AND I WISH MORE BOOKS WOULD DO THIS. yayyy. 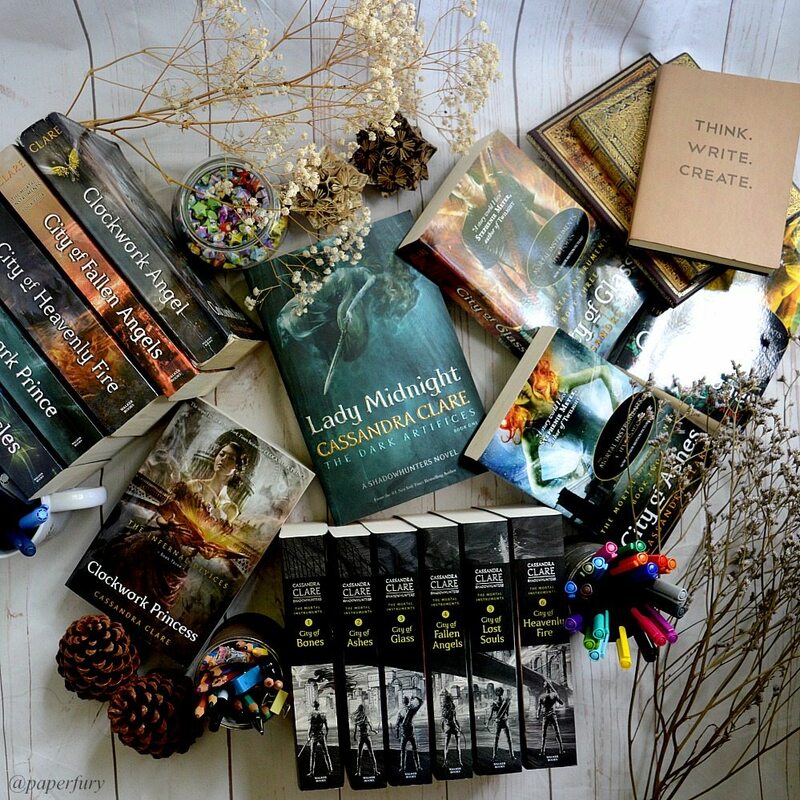 I am so happy that you loved Lady Midnight. I adored it so when people love it that same way I do 😀 haha. thanks for the review. YESSSS. HAPPY FLAILS FOR BOTH OF US, ANGEL!! And then miserable shrieks because we have to wait so long for the next one. lets not talk about the wait haha. But still, I devour Shadowhunter books and LOVE how many wondrous things Cassandra Clare brings to life (like real world things) such as homosexuality, autism family drama, etc. And your pictures in this review = glorious. I am almost finished with Lady Midnight and I’m loving it, though I agree with you that it is too long. 500-550 pages would have been good as well. What I really like is that the Faeries are important in this book, because in previous book we focussed on Vampires, Werewolfs and Warlocks, and now it’s the Faeries that are the main downworlders. I am so interested in the Wild Hunt (and maybe a bit attrackted to Gwyn uhm,…). I can’t wait to find out more about them in the next two books. I also really liked the love in this book. I totally ship Mark and Kieran, dispite what Kieran did. Honestly I have already forgiven him, he was heartbroken and wanted Mark back. I can’t wait to read the next book ugggghhhh. I do have to say that I was hoping for more Jem and Tessa in this book, but maybe that’s still coming, I’m on page 620 so I still have 100 to go. YUP. I think 500 pages would’ve been fine. 😂 Like I don’t exactly know what should’ve been cut? Maybe if they’d just got onto the mystery faster…I mean, with the length, I did get totally IMMERSED in the world and it was wonderful and great. But gah. It took forever. ARGH I LOVED YOUR REVIEW!!!!!!!!!!!!!! I am also a rabid Shadowhunter fangirl. Sadly I haven’t been able to read Lady Midnight, AND IT’S KILLING ME. I’m trying to finish The Infernal Devices and the Shadowhunter Acadmey novellas(because I’ve heard that the novellas tie into a plot twist in Lady Midnight) so yeah. I probably won’t get to read it until June. I CAN’T BELIEVE IT TOOK ME THIS LONG TO READ IT, ERMAGERD, I TOTALLY SHAME MY SHADOWHUNTER FANGIRL BONES. *flails dramatically* Ahem. I haven’t read the Academy novellas yet. Mostly because I’m waiting for them to come out in paperback? Or are they already? Trust them to do it without telling me. Hmph. Well actually they aren’t out in paperback yet. They come out in paperback sometime is September. I’m audiobooking them, and I swear George’s Scottish accent is giving me life lol 0_o You should read them. They are AMAZING. I’m so glad that you enjoyed Lady Midnight. I just purchased this book yesterday and the cover IS gorgeous! I haven’t read City of Heavenly Fire yet and I’ve had it on my shelf since it was released… But, maybe now that I have motivation to complete the series, I will! Definitely! Your enjoyment of this book makes me so excited! See, I love your reviews. I know I am not a fan of Shadowhunters yet – I’m only two books in. BUT… I want to continue and I want to love it. I own all of them, plus Lady Midnight and the Infernal Devices and I plan to read them all. What is your favourite so far? Mortal Instruments? Infernal Devices? Lady Midnight?? I have seen INCREDIBLE reviews for LM, so I am looking forward to getting to it. I’ve also heard that ID is better than MI, so we shall see. I totally agree about long books. I only feel it is ever truly necessary with epic fantasy, but even then I prefer 500 pages MAX. My main issue with City of Bones was the length and pacing of it. So 700 pages will hurt me, but I will deal with it if I am loving the book, the world and the characters – which it sounds like LM ticks all those boxes. Your Shadowhunter love does give me hope though. I really hope I come to love the series. I love Izzy, Simon and Magnus atm. Not a fan of Clary and Jace. I think my dislike of Clare is the main issue…. I can’t get over the plagiarism stuff, especially since it was proven and she still never apologised 🙁 This makes me sad. Writers work so hard and put everything into their stories and you can’t just take chunks of it – thankfully that was the fanfiction and this isn’t an issue with her novels! ..< Why can't bookworms get compassionate bookworm leave from work?!! THIS SHOULD BE A THING!!! Ooops… this has cut off a big chunk of my comment… Ooops!!! So the end makes no sense haha. I was just saying that I hope to love the series more as it goes long. Just need to separate my author feelings from my book feelings. I am rather excited for LM though, I have heard too many good things not to be. 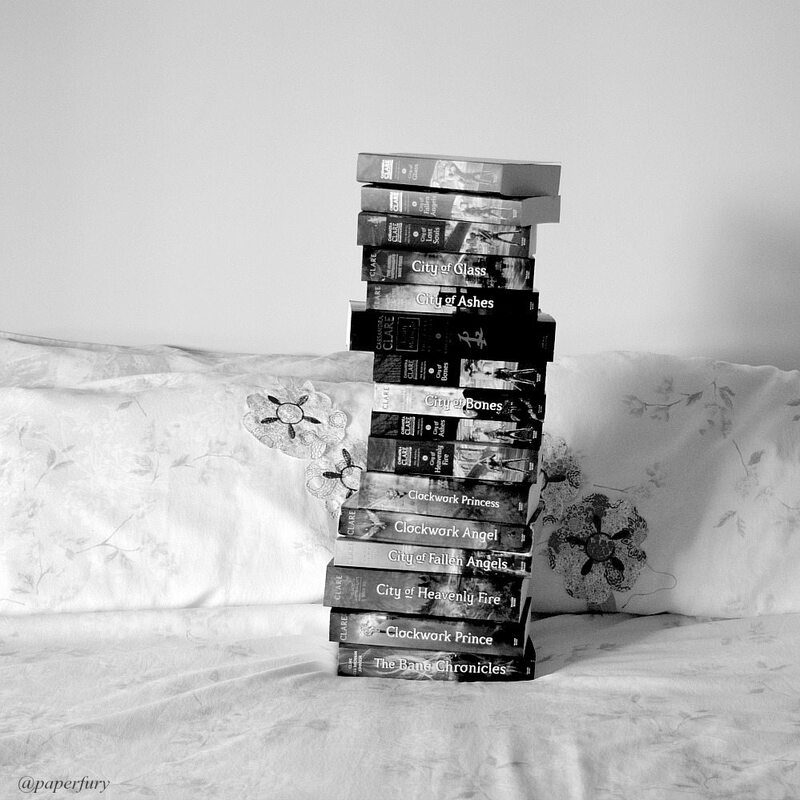 But, I still have 7 books in the series to go before I can even touch it… THIS MAKES ME SAD!!! I need more time. This is why I feel bookworm compassionate leave should be a thing. And I agree! Epic fantasies often need the time just to build the world. (Althoooough I adore how Rebel of the Sands built and interesting and complex world and kept it under 300-pages. HUZZAH.) And I mean, Shadowhunter books are technically fantasy. So yeah? I don't even know what I'd suggest to be cut. I just know that it gets a bit tedious after 500-pages. For me anyway. 😂 And omg if THIS book is the first of the new series and it's already 700-pages...WHAT IS THE FINAL BOOK GOING TO BE LIKE? I really don't understand the debacle over the plagiarism. I mean, I've read some articles, but I still don't quite agree. Maybe I'm biased because she's one of my favourite authors! But there aren't that many ideas out there?? And it's obvious people are going to have similar ideas?? And I also think we are human and DO make mistakes (with using chunks of other people's writing in her fanfics) so maybe that was a learning curve? Like, idek. Like I said, I'm probably biased because I love the Shadowhunter world so much!🙈🙊 But I do have a half-written discussion on how we view authors when reading and if we should or not. 😛 BECAUSE IT'S AN INTERESTING TOPIC!! Oh, yeah, you’re like opposite to everyone I speak to. They all rave about Infernal Devices more than Mortal Instruments. But characters are super important to me, so if the characters in ID annoy me, then I probably won’t enjoy it as much. We will see. I have a long way to go with this series, 7 books and god knows how many pages that is!!! >.< I am up for this momentous task. Oh yeah, totally agree that there aren't enough ideas out there and there will always be similarities. I didn't have issues with MI because of plagiarism. I know it was taken from her Draco fanfic – so Jace was originally Draco, Clary was Ginny, Luke was Lupin, Valentine was Voldemort, Circle was Death Eaters and so on. But she changed all of that for the book and she came up with a completely new story for it and made her characters her own. My issue was with the plagiarism of her orginal fanfiction, which got taken down – she took whole chunks from other books and things. And then didn't ever say sorry. Which, just, NO! At least own up to it and apologise. Definitely think it was a learning point for her though, as I don't think that issue has ever occurred again in any of her published books. I'm going to be discussing it when reviewing the first two books, as I feel it hindered my reading experience a bit. And I don't want to let stupid bias about the author change how I feel about the book as a story or work of fiction, as I'm not sure that's completely fair. Everyone makes me mistakes and I should just take a cue from Elsa and LET IT GO!!!! 🙂 HAHA Which I am sure I will. I own all her books so I'm going to read them all and I might learn to love the MI. Magnus is what I need more of right now. If he appears more in the next four books then I will be totally and completely happy. I LOVE HIM <3 He is so snarky and sassy and just awesome. I need to learn to love Simon… book two Simon is super clingy haha. YES!!! Rebel of the Sands totally pulled off the world building in so few pages. AUTHORS NEED TO LEARN A THING OR TWO FROM THAT!!! I hate to think what the final book in the series will look like… some 3,000 page behemoth! Our poor arms will strain under the weight of the thing. My comments are getting far too long. All these discussion posts I've been typing up or obviously not good. I am clearing just spewing rubbish out, haha. As for the long book debate: I’ve been discussing this lately with an editor friend and we agreed that any book with over 600 pages could definitely be shorter for at least a 100 pages (we spoke about the second Rothfuss book which has a 1000, I think, and could easily be a full 300 shorter). I think writing long books is okay if the writing, the plot, and everything is TIGHT. But it becomes stretched and boring all too soon. And my editor friend said that small publishing houses like theirs (the largest in Slovenia, but we have a TINY book market) can’t really afford such long books, because even the translation is so expensive because of its sheer length that they’d have to sell a ridiculous number of hardback copies (ridiculous for our market) to break even, let alone make profit. I know most English-speaking writers never think about this when they’re writing their books, but it’s one of the factors that makes foreign publishers decline a translation sometimes. BASICALLY YES. Omg and fuelling oneself with books after writing is an EXCELLENT idea. 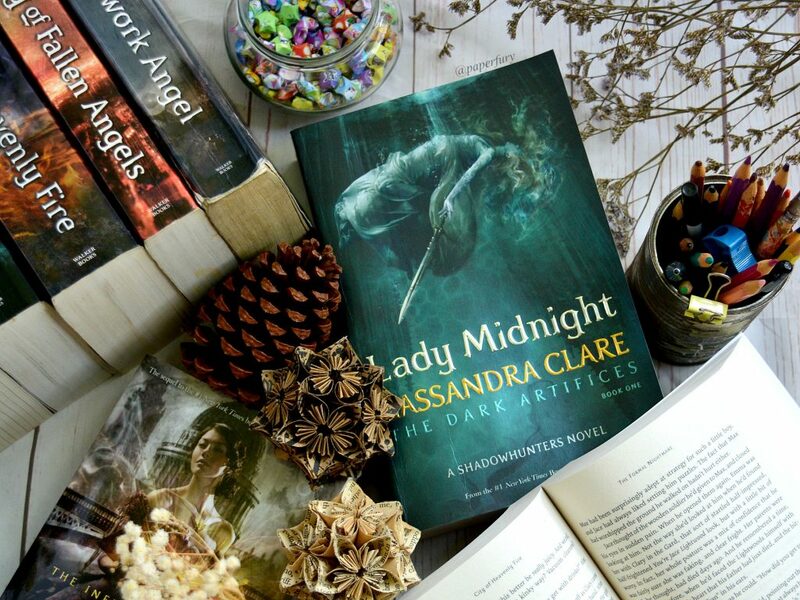 I am a HUGE fan of the shadowhunters series and I am SO happy that you enjoyed Lady Midnight! I’ve been putting off reading it for quite a while now (I don’t want to be disappointed! I don’t think I can handle seeing Jem and Tessa’s names without crying because they made my cry so hard beforeeee AHHHH), and seeing a positive review from a trusted reviewer makes me all the more excited to read it! I just KNOW that I am going to fall in love with Emma and Julian and all the characters, and oh gosh I am so excited for all the cameos! Your review is giving me ALL THE FEELS. And to answer your questions… Jem will always be my favorite shadowhunter. (But Will is a very very very veeeeery close second!) And I love The Infernal Devices with ALL MY HEART AND SOUL. Heh but I do agree the book does seem a bit too long! Omgggg, I’m not alone knowing the bedtime stories!! 😂 I had trouble concentrating whenever they called him Uncle Arthur because of that. I’m on hold for this at my library! I’m SO EXCITED. I loved your review, too, it gave me a taste of what is to come. So Shadowhunters aren’t my favourite favourites, but I do like them, especially the Infernal Devices (read: especially Clockwork Princess). I… like long books. If it’s done well and the plots and subplots and characters hold together, the length doesn’t matter… And sometimes as you go on books get better. But sometimes stuff could be cut out? I don’t know, but I do err on the long side with my own writing, so maybe I’m biased. I’m so damn freakishly excited for this book, Cait. I had a mini heart attack when I saw it sitting on the shelves of my library, because I would’ve thought there’d be 9183747449 reserves on it before me. I so get what you mean by the length, but I’m actually opposite of you there—I LOVE long books (maybe a bit too much, haha.) So fingers crossed this one won’t seem tooooo long for me. but seriously I was re-organising my bookshelves the other day and almost broke my freaking wrist moving around A DANCE WITH DRAGONS (the US hardcover edition that isn’t split into two volumes.) SO I FEEL YOUR PAIN. A DANCE WITH DRAGONS IS RIDICULOUS. I just have the paperback with it all in one book, but it’s like this square cube omg. I do agree the books are too long though. They’re really daunting? I actually put off Lady Midnight for quite a while because the length scared me. *gulps* And I’m worried that if this is the length of book ONE…what will the finale be like?!?!??!? I just finished Lady Midnight two day ago! The only other shadowhunter series I read is the infernal devices. I missed Jem and Tessa so much (although I liked Will more). Sometimes I feel like super long books are necessary if it’s well written and I really like the book. 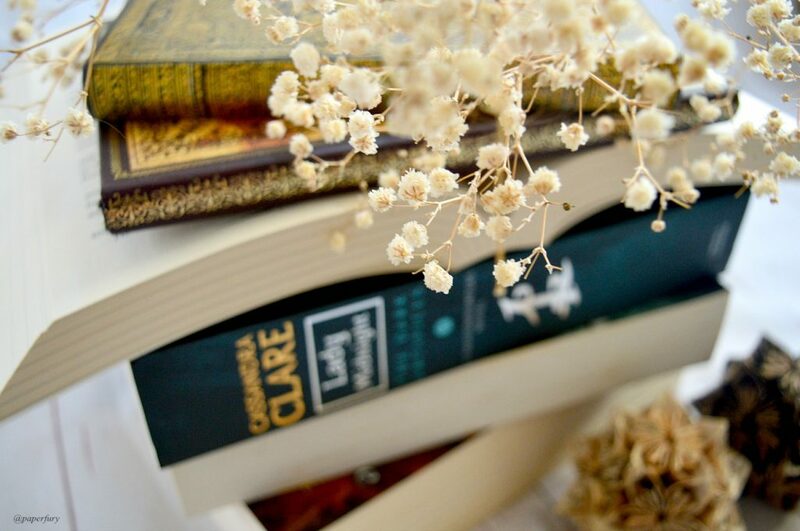 Like Sarah J. Maas, her books could have infinity pages and I would be like, “Challenge accepted.” I don’t know if I have a favorite Cassandra Clare book. I love that Lady Midnight had Faeries in it. I am obsessed with a good story about faeries. Mark is by far my favorites character. I loved how when he came back and he was always so humorously formal. Like when they had to explain Skype, the Plate of Strawberries, or when he broke Tavvy’s stuffed animal and called himself a murderer. His last line totally freaked me out though *me flailing forever (or until next book)*. I also wish Cristina and Emma were Parbatai, oh how I wish. I do think it is a little stupid how everyone wanted to get lashings, and Diego wasn’t even there but he was like “I should have gotten them, I’m more muscular.” I don’t really like Diego either. Also is anyone else wondering how is Church alive?! Who is your favorite character? I think I’m stuck between Mark and Emma. I think Church is MAGICAL. That’s great! 😀 Yeah I do too. I’ll be keeping an eye out for it at the library. Sounds good, I like that you can read it without reading the other ones. I still haven’t gotten through them all yet. There are a LOT to get through right?! Eeep. It can be intimidating!! OMG I NEED TO CATCH UP AND READ THIS HNNNNNNNGGGG. I’ve read the first four books in TMI and the first book in TID, so I won’t be reading Lady Midnight anytime soon. I really want to, thoughhhhhh. I think my favorite book I’ve read so far is TMI #3. It was the perfect wrap up to what was once a trilogy and I just loved it! Favorite character? That’s too hard. But I always think of Simon when I think of this series, so I pick him. I think super long books are fine, but for a first book in the series? It’s like DAYYYUMMM. I think for YA it’s just out of the ordinary, so that’s probably why it’s so intimidating, but it’s also probably filled with gloriousness (I mean, if your review is any indication, then the answer is yes). I can’t wait to read it! I couldn’t read anything for about a week because I couldn’t get over this book! I still can’t…. And I loved Mark the most – closely followed by Ty. I’m so looking forward to reading more about him. Maybe you would like to check out my Lady Midnight Soundtrack? When I love books I think about then while listening to music and sometimes it is so perfectly fitting. I haven’t read any of this series, but my friend has been reading some Cassandra Clare books and says they’re awesome, so perhaps I shall have to try reading them at some point. As long as they’re well-written, I positively love long books. I adore them. It’s like…actually, I don’t know that I have a good enough metaphor. But you know, you get to stay with the characters longer, and as long as it’s well-written, there’s generally more plots and more characters and just more awesomeness, so it’s even more interesting than shorter books are to me. Also, I find all the world building and stuff interesting. I’ve read The Mortal Instruments, but I have not yet read The Infernal Devices. Which is horrid of me, because SO many people have asked me to read it, and told me I will love it. I really hope I do, because I don’t have the best track record when it comes to people telling me I will love things (by which I mean I usually end up not liking them D:). 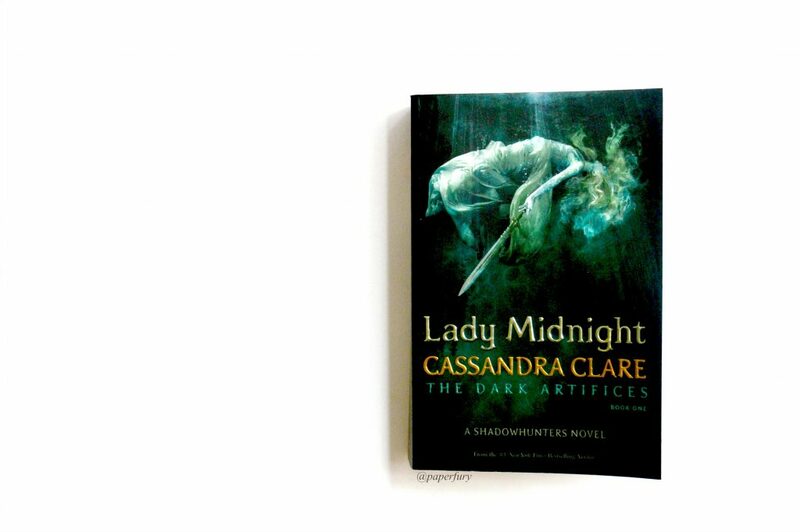 I am super keen for Lady Midnight. I feel like I kind of already started it because I read CoHF not that long ago, and that introduced Emma, so I feel like I know her a bit already. YAY. And it sounds pretty awesome, from what I’ve read about it. As for long books: no. I am not a huge fan, and most of the time when I read them, I think: this could have been shorter. I just don’t really think that some books need to be as long as they are. I mean, some books DO, to fit everything in. But sometimes I read a really long book and it gets stagnant in parts (like CoHF. I felt like that was WAY too long). I’m super glad that this book lives up to your love of the Shadowhunters world, Cait! *whispers* I secretly prefer not to be pressured into reading books too. So I do understand! I actually didn’t like The Infernal Devices so much?🙈🙊 I’m more of a modern-fantasy person anyway aaaaand my ship (WHICH WAS TOTALLY NOWHERE NEAR GOING TO BE CANON) sunk. So boo. 😂 I have gotten into a bad habit of non-cannon ships lately. 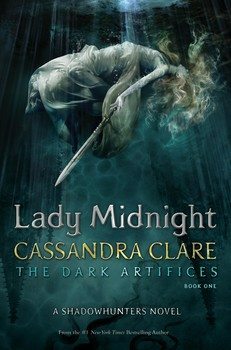 I’ve heard so many amazing things about Lady Midnight! I really want to read it, but a bunch of people have said that you should read Tales from Shadowhunter Academy before Lady Midnight, and I have a rule about not reading ebooks when I’m in school because last time a teacher nearly confiscated my Kindle. It was not a fun day. I’ll have to wait until I have a not-too-busy weekend. And maybe the anticipation will make it even more satisfying when I finally read it! (Also my TBR pile is about to actually crush me and adding a book as big as Lady Midnight would probably topple it over.) I’m even MORE excited for Chain of Thorns, though – I LOVE historical fiction, I loved the little bits of that world we saw in The Bane Chronicles, and basically I need that series right now! AWK. Nearly getting your kindle confiscated is NOT GOOD. eeep. I actually hadn’t heard you should read Tales from the Academy first, gah, I haven’t read it.🙈🙊 I want to! But I’m waiting for paperback as well. 😛 (And omg the TBR is unforgiving isn’t it?!) THE BANE CHRONICLES MADE ME LAUGH SO SO MUCH. I read City of Bones ages ago, and whilst I loved the world it was set in, I didn’t absolutely love the book. 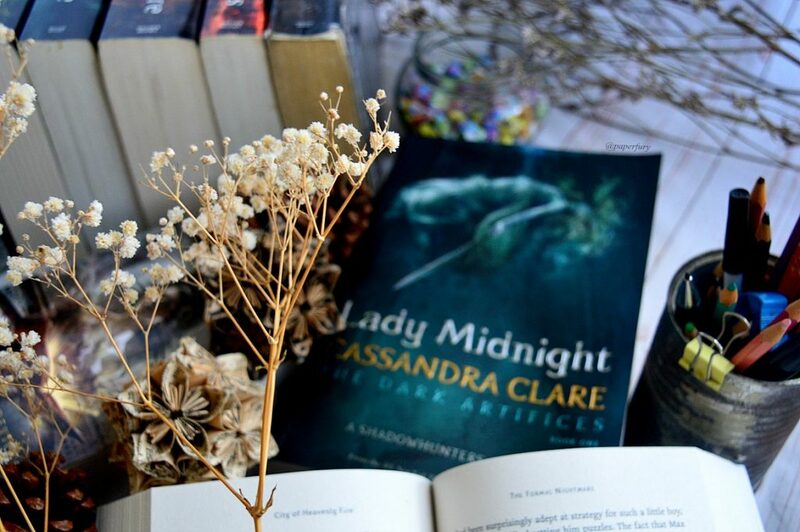 Seeing this book everywhere recently has kind of made me want to carry on with the series to see if I get into it more though, and I really want to read Lady Midnight because so many people seem to have loved it, but I feel like I should finish the Mortal Instruments series first. Hopefully I’ll get round to finishing the Mortal Instruments soon! Great review! Yes! TOTALLY AGREE! 🎉 The pacing wasn’t awful or anything, in fact, I think it was fine?! I just felt like it went on too long. If that even makes sense.🙈🙊 But then all the “not-so-useful” scenes like the family calamities (TAVVY IN THE BAG OF SUGAR) were my favourite so omg I couldn’t really pick what should’ve been cut!! AHem. OMG CAIT I’VE BEEN TURNED INTO A RABID SHADOWHUNTER FAN AS WELL. I mean, I still don’t like The Mortal Instruments (the first four that I actually read, I mean). BUT THIS WAS AMAZING. Where has Cassandra Clare been all my life??? I probably won’t read the ones set in 1903 because I pretty much despise historical books, but LORD OF SHADOWS COME AT ME. I am actually now very excited! I have read the first three of the TMI series but that was some time back, so I’m planning to read all six books soon. I wasn’t sure if I would want to read the extended universe – the Tales From The Shadowhunters Academy or TID, but your flailing (and the fact that I absolutely adore the show right now and am hoping they start bringing in more threads from all aspects of the universe) is making me super enthused!